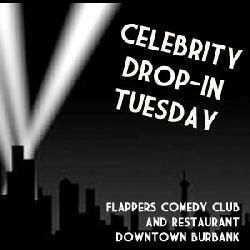 Celebrity Drop In Tuesday's becoming Burbank's hottest shows! Every week, awesome celebrity comedians and national headliners grace the Flappers stage - you never know who might be dropping by! Past guests have included Jerry Seinfeld, Conan O'Brien, Bill Burr, Christopher Titus, Whitney Cummings, Adam Devine, Joey Diaz, Adam Sandler, and more!